Jam, winner of the Grand Jury Prize for Best Documentary at the 2006 SXSW Film Festival, premieres tonight at 9PM (EDT) on the Sundance Channel. Jam was directed by sucessful movie trailer man Mark Woolen and produced by Woolen, Scott Mitsui, and Myles “Randy” Bender. They were television sports stars of the ’60s and ’70s, a bigger draw than major league baseball. And then, virtually overnight, they disappeared. Now, one man has brought them all back to reclaim their lost glory! 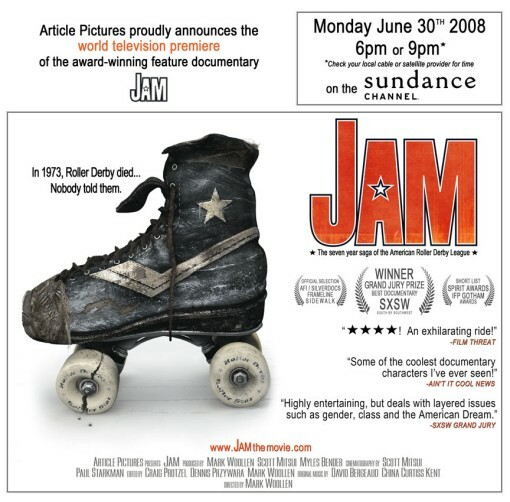 Shot over seven years (1998-2004), JAM follows the saga of the America Roller Derby League, a group of fading Roller Derby stars who, despite the fact that they are in their 50s and 60s, are determined to make the sport a national sensation once again.